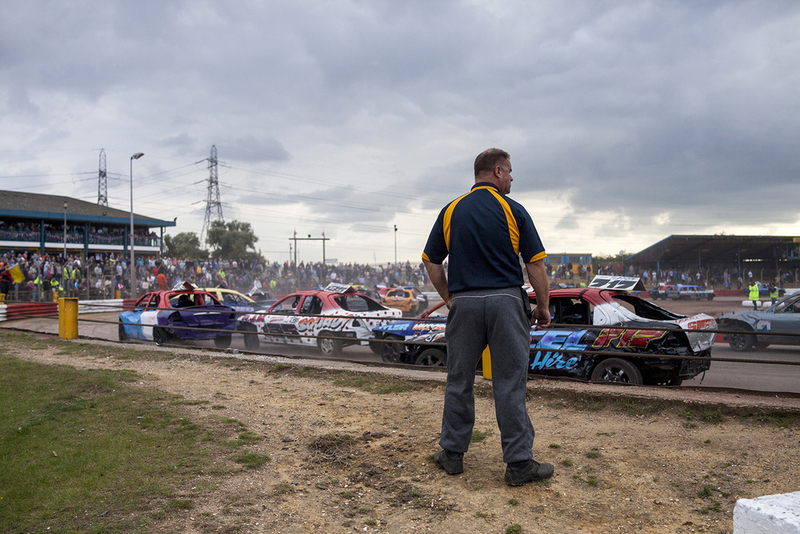 Spectators watch the final wildcard entry heat during the Spedeworth Unlimited National Bangers World Final event at Foxhall Stadium, Ipswich. Oct 2015. "My Dad used to race bangers in the late 1980's and Early 90's..I really enjoy racing.. I especially like to win.. When I was racing in Ninja Karts I won the 2013 Ipswich Spede-Weekend race, which was fun"
Callum (11) has been racing for 4 years starting out in the Ninja Karts category and then moving to Junior Rods. Driver #329, Wayne Wigley, takes to the track post-race after retiring due to a spin out at the exit of turn two during the 2nd heat of the the 3rd round of the Spedeworth National Bangers Championship at Wimbledon Stadium. 26/10/2014. "Racing Means a lot to me. It's a big part of my life. I love being in the racing community.. there's loads of good banter with all the racing lads... and what happens on the track stays on the track. The best part of my racing career to date was when only me and my brother were left in a destruction derby and I had to finish him off with a big head-on smash... we got a great picture of that" - Nicky ' Nicky Boy' Dingle (29) - races in the Spedeworth Rookie Bangers class alongside his brother. Driver #275, David Mckeown, bolts his hood back into place ahead of the final heat of the 3rd round of the Spedeworth National Bangers league at Wimbledon Stadium. 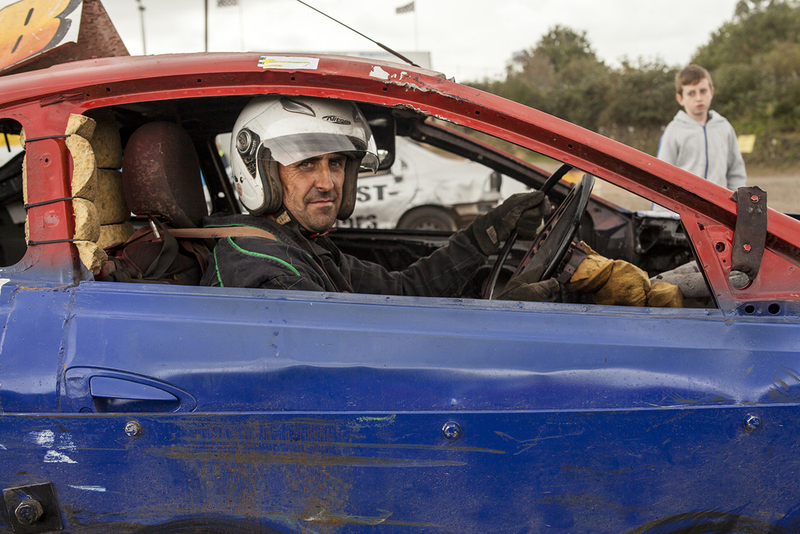 "I'm here all the time, I drive in the bangers. and when I'm not driving I marshal here. I love it. 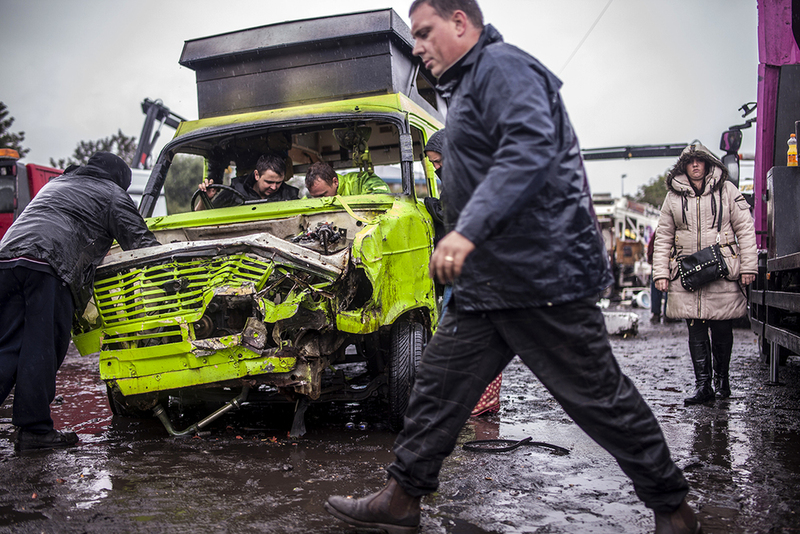 My mum works on the recovery truck too... Last year the BBC filmed down here for a documentary, they filmed one of my races, and I wrecked my car in that race. It was great"
"I love racing, it means everything to me. I do it every weekend mainly, so it's in my blood...my favourite thing about racing is when I win" Orci Minstox driver #561 Aaron 'Flash Jr' Totham, Aaron has been driving in the ministox class for 4 seasons now. In 4 seasons Aaron has won 2 races and had numerous 2nd and 3rd place finishes. one of his great loves of the sport is the competitiveness among the drivers "my favourite person to race against is Charlie 'Binks' Lobb. but but i enjoy racing pretty much everyone"
A race marshal oversees action at turn three during a destruction derby event at Arena Essex Raceway. 2014. Applying finishing touches to the Yob Mob caravan banger ahead of a special caravan bangers event at Arena Essex Raceway.